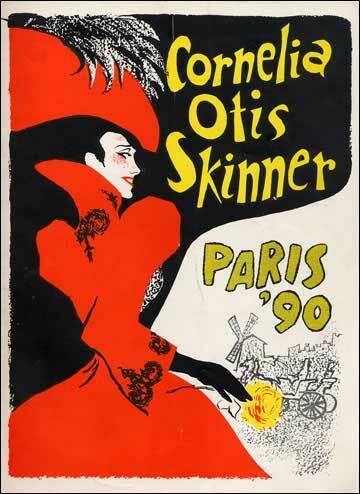 Paris '90, Cornelia Otis Skinner's one-woman show, toured the country before opening at the Booth Theater on Broadway in 1952. The show opened in March 1952, for a limited engagement of 87 performances. 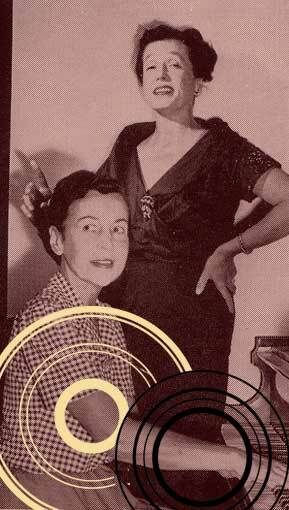 Cornelia Otis Skinner (at left, standing, with Kay Swift at the piano) was the daughter of the actor Otis Skinner, who spent a great deal of time in Paris. As a child, she was brought up on tales of Paris in the Gay Nineties and stories about Henri Toulouse-Lautrec, with whom Otis Skinner was acquainted. Later, she studied at the Comedie Française. A series of vignettes reminiscent of Ruth Draper's monologues, the show was written by Skinner herself and celebrated the women depicted by Toulouse-Lautrec. Paris '90 was divided into three sections, with a total of 13 inhabitants of the Right Bank, where we meet a lady of fashion; the Left Bank, where we visit a laundress and a pair of spinster Boston school-teachers; and Montmartre, where Skinner brings several characters from Lautrec's art to life, from the café singer-composer Yvette Guilbert to the earthy prostitute known as Deaf Bertha. The Kay Swift score was orchestrated by the legendary Robert Russell Bennett, and the orchestra was conducted by the equally legendary Nathaniel Shilkret. For a small show it's a big score -- Paris '90 has an overture, underscoring, and incidental music, which may have been required to give Miss Skinner time to change costumes. Purchase Paris '90 at Amazon.com.